Mangaluru July 14, 2016: Senior Congress leader B Janardhana Poojary has expressed his outrage over the behaviour of Chief Minister Siddaramaiah for defending the abettors in the DySP Ganapathy suicide case. He has also demanded the immediate resignation of the Chief Minister over this issue. 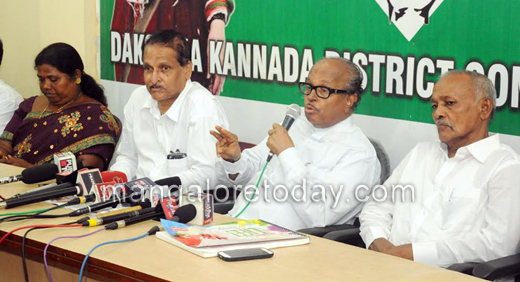 Poojary demanded CM’s resignation. Addressing the Press at Congress office on July 14 Thursday, he said "before ending his life Late DySP Ganapathy mentioned three names including that of Minister KJ George in an interview. Being the Chief Minister of the state it is unfortunate that the CM has failed to register FIR against them so far." The CM should be ashamed of himself for defending the abettors of the suicide, he said. "The CM has failed to accept the statements made by Ganapathy’s father and brother. But, why can’t he accept the statement made by Ganapathy’s wife?," questioned Poojary. Kallige Tharanath Shetty, Arun Coelho, Corporator Appi and others were present.